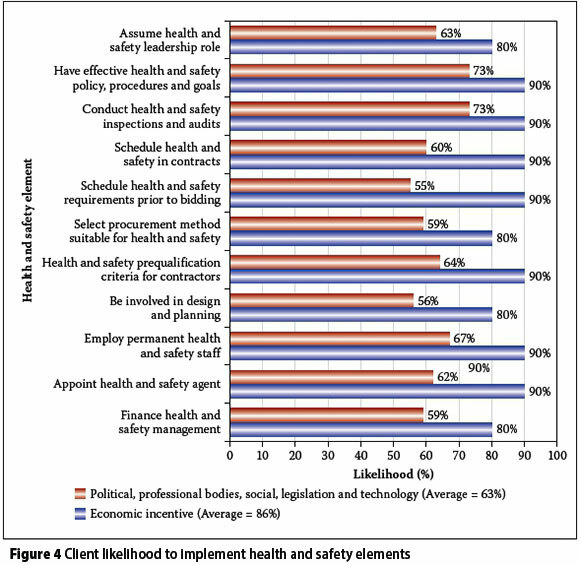 The use of economic incentives to improve health and safety (H&S) performance in the construction industry in general has been investigated by various scholars. However, few studies have looked at the impact of economic incentives on construction clients, especially in the developing world. This paper reports findings on the feasibility of incentives to influence construction clients to perform on H&S. The investigation was conducted using a Delphi technique to determine the impact significance of economic incentives or disincentives on construction clients' H&S performance. A panel of experts in construction H&S was assembled from most regions of the world. A three-round iterative Delphi study aimed at establishing consensus from the expert panel was then conducted. The study found that economic factors have critical impact significance on clients' H&S performance, and that clients were 'very likely' to implement various H&S elements as a result of the economic incentives and or disincentives. There is little research on the use of incentives to influence construction clients' H&S performance and the effectiveness of such incentives. This gap in literature, and the need for improvement in construction H&S performance, motivated the current study. Therefore it was necessary to investigate specifically the extent to which economic incentives could be used to influence construction clients to become involved in H&S programmes. Economic incentives are considered to be a proactive way of improving H&S performance among other key parties, such as employees in the construction industry. The paper reports on the findings from an analysis of the impact significance of economic incentives on clients. It underscores the point that economic incentives or disincentives for construction clients are necessary to encourage them to actively participate in H&S programmes, hence resulting in performance improvement. Construction clients lack the motivation to actively participate in health and safety (H&S) programmes in the construction industry. Anecdotal views seem to indicate that the possible reasons for their lack of participation may include the view that clients do not suffer loss directly in the event of an accident. A question arises therefore as to what would motivate clients to actively participate in H&S programmes. Economic incentives have been reported to produce favourable results with other H&S stakeholders. However, there is no reported evidence on the effectiveness of economic incentives on clients. Therefore it was necessary in the current study to investigate the effectiveness of economic incentives to influence clients to actively participate in H&S programmes and hence improve H&S performance. Literature informs that the use of incentives as a method to promote a culture within which technical and process innovation can flourish is critical to project success (Tang et al 2008). Similarly, economic incentives have been shown to yield positive results in H&S performance (European Agency for Safety & Health at Work 2010). It is in view of this that Elsler and Nikov (2003) contend that there is a need for economic incentives to proactively promote H&S. Some of the reasons why economic incentives have been contemplated include the failure of strict regulatory approaches, the costs involved in bringing organisations to courts for non-compliance and the low level of fines which have failed to encourage organisations to comply (Elsler & Nikov 2003). However, it is also acknowledged that economic incentives are only effective when they are directed at organisational or national level (European Agency for Safety & Health at Work 2010). Consequently, the economic incentives may entail linking fiscal incentives, such as lower accident insurance premiums or tax rates, to a good H&S performance for an organisation. Other methods to incentivise, for example, employers to implement H&S, may include matchup funds where a grant is given to an employer equal in amount to the amount to be spent on H&S, or linking an incentive amount to a voluntary audit or inspection (European Agency for Safety & Health at Work 2010). In order to achieve the desired goals from the economic incentives, their design and use should take into account the constraints and risks of a project, organisation or indeed the nation. Incentives should make risk allocation fairer, because incentives can be seen as the sharing of rewards for good performance, and this may motivate the participants to perform better (Tang et al 2008). The reason why economic incentives are said to work on the contractors' side, or are seen as one of the solutions to proactively improve H&S, is partly because of the cost of ensuring H&S, which is usually borne by the contractors (Elsler & Nikov 2003). Contractors work at reducing the cost in order for them to remain competitive. Bishop et al (2009) rightly argue that the unacceptability of occupational H&S performance of the building and construction industry can be attributed to the powerful competitive forces in the industry, which ultimately work against H&S. He observed that the industry strives to complete projects on time in order to reduce costs, and too often H&S is neglected. The solution may be a cultural and behavioural change, and this may only come about by harnessing the competitive forces in the industry to work for occupational H&S. Both organisations and government departments at times lack the requisite resources, and this inhibits a meaningful improvement of H&S. A lack of resources or underfunding for H&S programmes limits any action. For example, in Tanzania less than 1% of the Labour Department's budget was allocated to occupational H&S (Kamuzora 2006). This kind of allocation can result in a low capacity to enforce legislation, and failure to conduct inspection and surveillance. According to Cotton et al (2005), contractors, or indeed other stakeholders, are unlikely to see the need of implementing H&S without the application of incentives or sanctions, especially in developing countries. The benefits of incentives are clear. The European Agency for Safety and Health and Work (2010) demonstrated from a case study of six organisations in Europe that improvements of 25% to 70% were possible with economic incentives. However, for the incentives to be effective, they should be provided by national and or international organisations. Consequently political will is necessary for the national or international organisations to be involved. The use of economic incentives to improve H&S performance in the construction industry in general has been investigated by various scholars. However, few studies have looked at the impact of economic incentives for construction clients, especially in the developing world. Therefore it was necessary to investigate specifically the impact of the economic incentive on clients' H&S performance. Studies have shown that economic incentives have produced positive results for contractors and employees. However, it is not clear how economic incentives would impact the H&S performance of clients. The focus was therefore placed on clients, because they can influence project H&S performance (Huang & Hinze 2006). A Delphi study technique was used to explore the impact significance of economic incentives on clients' H&S performance. The Delphi method was preferred to common survey methods, as the current study was addressing the 'what could happen if' kind of question as opposed to the 'what is' kind of question (Hsu & Sandford 2007). The Delphi method was also considered to be much stronger for its rigorous query of experts, which is achieved through many iterations and feedback. The Delphi study involved 11 panel members. This number of panellists was considered adequate based on what other Delphi studies have used and recommended. Delbecq et al (1975) suggest that 10 to 15 panellists could be sufficient if the background of the panellists is homogenous. A review by Rowe and Wright (1999) indicates that the size of a Delphi panel has ranged from three to 80 in peer-reviewed studies. Okoli and Pawlowski (2004), and Skulmoski et al (2007) also mention a panel size of about 10 to 18 members. Hallowell and Gambatese (2010) suggest a minimum of eight panellists. Based on the above, and the fact that the Delphi method does not depend on statistical power (Okoli & Pawlowski 2004), but rather on group dynamics for arriving at consensus among experts, a panel of 11 members was considered adequate. However, the choice of panel members was critical. Delphi is a group-decision mechanism requiring qualified experts who have deep understanding of the issues (Okoli & Pawlowski 2004). Therefore one of the most critical requirements is the selection of qualified experts, as it is the most important step in the entire Delphi process because it directly relates to the quality of the results generated (Hsu & Sandford 2007). In view of the above, successful panel members had to meet a set of criteria which included qualification, experience, publication record, and capacity and willingness to participate in the study. Panel members were identified from three sources. The first source was the CIB W099 register of members located on the CIB WO99 website (CIB 2010). The CIB W099 is a working commission that was set up by royal appointment to enable researchers on construction H&S in the world to collaborate and protect H&S. The second source was the conference proceedings of the CIB WO99 from 2005 to 2009. Individuals who had frequently appeared as authors or keynote speakers were identified as potential experts for the study. The third and last source was identifying, through references, individuals working in the area of H&S in the local construction industry in southern Africa. The panel consisted of two members from South Africa, three each from the United States of America (USA) and the United Kingdom (UK), and one each from Singapore, Hong Kong and Sweden. All the panellists specialised in construction safety. In terms of their current occupation, three of the panellists were employed by contracting organisations, two by consulting organisations, and six by universities. All panellists held very senior positions in their organisations and were involved in community service. The panel had a cumulative of 243 years of experience. The lowest number of years of experience was seven and the highest 45. The calculated mode of years of experience was 15, the mean 22.1, and the median 15 years. Experience was an important factor in determining who an expert was, and therefore the minimum number of years was set at five. In terms of publications, ten of the panellists had published in peer-reviewed journals, conference proceedings and books. 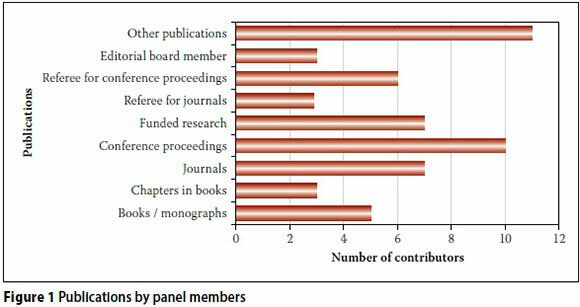 Between them, they had published 57 books and monographs, 19 chapters in books, 187 peer-reviewed academic journals, 345 recent conference papers and 341 other publications comprising articles in professional journals, technical reports, policy papers, expert witness documentation and keynote addresses (Table 1). In addition to their publications, the panel had led and managed 108 funded research projects. 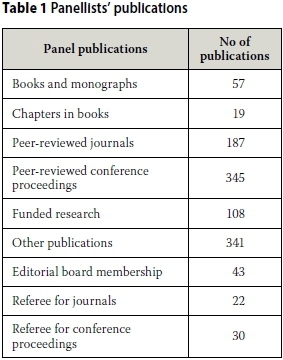 Three panellists served on the editorial boards of 43 peer-reviewed journals and conference proceedings (Figure 1). The Delphi study involved three rounds of an iterative process before consensus between the panel members on the impact significance of economic incentives on clients' H&S performance was reached. Panellists were requested to rate the probability that clients would implement H&S elements as a result of influence from external environmental factors, including economic incentives. The probability scale ranged from 1 to 10 representing 0 to 100%. Further, panellists were requested to rate the impact of external environmental factors on client performance. The impact scale was based on a 10-point rating scale ranging from low to critical. This aspect indicated the severity of a factor. A two-stage analysis of data from the Delphi was conducted using Microsoft Office Excel, which is a spreadsheet software programme. The first stage involved analysis to establish or confirm consensus on responses to the predetermined criteria. This involved determining the group median responses for each question. After the third round of the Delphi, absolute deviations (Di) about the group medians (m(X)) of each rating for every question were calculated using Equation 1. In addition, mean absolute deviations (MAD) were calculated for every question. This is a calculated mean of all absolute deviations for all panellists about the median on each question. Further analysis involved determining the statistical range in ratings by panellists on each question, and the percentage of panellists with a similar opinion inclination on each and every question. Consensus was determined to have been achieved when the MAD was less than one unit below or above the group median, the range in ratings on each question between all panellists was below 4.0 and the percentage of panellists that were of a similar inclination in opinion was 60% and above on a particular question. The second stage of Delphi data analysis involved determining the impact significance of environmental factors on client H&S performance. The significance of the impact of environmental factors was categorised as critical, major, moderate, minor or low. The categorisation was helpful in determining which environmental factor was more critical to client H&S performance. The impact significance of a factor was obtained as a product of the overall rated probability (likelihood) that an environmental factor would influence clients to implement H&S elements, and the rated negative impact (severity) on clients' implementing the elements that would result if the environmental factor was absent. This relationship is illustrated in Equation 2. The second research question required the panel of experts to rate and reach consensus on what they determined to be the impact on clients' H&S culture in the absence of economic incentives for clients to implement H&S. This particular question sought to establish whether the client H&S culture would be better with an application of economic incentives for clients to implement H&S. Findings to the questions raised in the study are presented in the next section (Results) and discussed later in order to inform the conclusions and recommendations. The influence of external environmental factors on client H&S performance was evaluated. The external environment was defined by six factors, namely: political, social, economic, legislative, professional bodies and technology. The impact significance of these factors' influence on client H&S performance was obtained as a product of clients' likelihood to implement H&S elements, and the severity rating or negative impact on clients' H&S performance if the factors were absent. The level of influence was determined by assessing the extent to which a client would implement various H&S elements if pressured by the external environment. The severity of an environmental factor was the rated negative effect on client H&S performance that would result from the absence of an environmental factor. The severity rating was based on an ordinal scale of 0 to 10, with 0 being negligible and 10 critical. The impact significance was obtained as a product of the severity rating of an environmental factor and the likelihood of the client implementing a particular H&S element (refer to Equation 2). Of the six environmental factors, three, namely political, economic and legislative, were determined to have an impact significance of over 5.0. The economic and legislative factors had an impact significance of 7.77 each (Figure 2). According to the classification scale used in this study a rating of 7.77 was considered to be 'critical'. The rating suggested that an economic incentive was critical to a client implementing the required H&S elements or programmes. 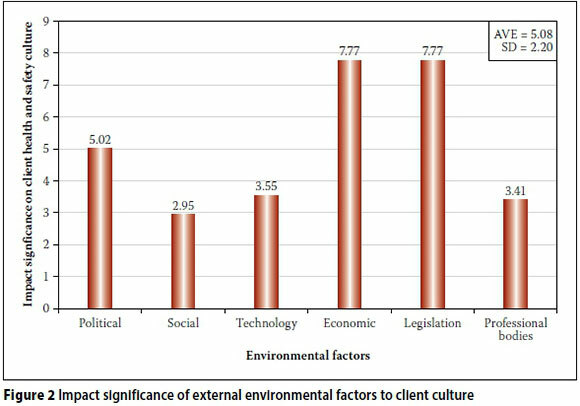 The likelihood of clients implementing H&S elements as a result of the external environment's influence was 67% on average (Figure 3). The standard deviation in the likelihood ratings was 0.06. The small standard deviation suggested that the likelihood of the client implementing the H&S elements was almost the same. 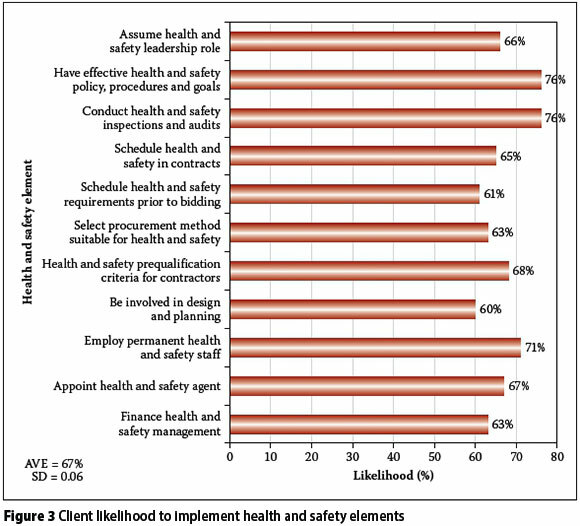 Clients were least likely to be involved in design and planning of H&S activities. The likelihood for this element was determined to be 60% (see Figure 3). On the other hand, clients were most likely to conduct H&S audits and inspections, and have H&S policies, procedures and goals. The likelihood for these H&S elements was determined to be 76% each. However, with economic incentives, clients were more likely to implement the H&S elements, with an average likelihood of 86% (Figure 4). With economic incentives, clients were 'very likely' to implement all the H&S elements (Figure 4). In comparison, the average likelihood that the client would implement H&S elements as a result of the influence of political, legislation, social, technological and professional bodies was 63% (Figure 4). Findings from the study indicated that economic incentives had a critical impact significance on client H&S performance, and that clients were very likely to implement H&S elements with economic incentives when compared to other factors such as political influence. These findings collaborate with that of the European Agency for Safety and Health at Work (2010). The European Agency for Safety and Health at Work demonstrated from a case study of six organisations in Europe that improvements of about 25% to 70% were possible with economic incentives. It is envisioned therefore that similar results may be obtained when clients are incentivised, considering that the study found that clients were very likely to implement H&S elements (above 80% likelihood) if economic incentives were present. Economic incentives may be effective to motivate clients to participate in H&S management. Without economic incentives, clients may continue to consider themselves not critical H&S stakeholders, and might therefore not participate effectively in implementing H&S. According to Cotton et al (2005), stakeholders are unlikely to see the need of implementing H&S without the application of incentives or sanctions, especially in developing countries. The current study found that economic incentives had almost the same impact on H&S performance as legislation. However, it has been observed that using legislation alone to influence clients to implement H&S elements may not achieve the desired results. Using legislation alone is problematic, because in most parts of the world the ineffectiveness is not necessarily with the legislative regime that is in place, but with its enforcement. In the United Kingdom, the House of Commons noted that, although breaches of H&S regulations are serious criminal offences and legislation provides for penalties, courts have tended not to impose the maximum penalties available (House of Commons 2004). In South Africa the problem of enforcement was also identified, describing it to be inadequate (CIDB 2008). A need therefore arose to establish other forms of incentives in addition to legislation. Legislation can facilitate the implementation of economic incentives for clients. The role that the legislative environment can play to facilitate economic incentives on both public and private clients is to have the requirement enshrined in the laws. It is easy to allocate finance if there is pressure from regulations, for example by demanding that financial allocation for H&S should be specified in the proposal. That would enable the client to ensure that finance is actually allowed for this purpose, and consequently a contractor would not be able to question client demands when the client is only complying with legislative requirements (Törner & Pousette 2009). It is clear that, for economic incentives to work, the regulatory framework has to be in place that specifically addresses its implementation. According to the European Agency for Safety and Health at Work (2010), regulation and economic incentives are complementary. Therefore, in order to effect economic incentives practically, appropriate regulation must be in place. Examples of the measures that regulation can address include the requirement for clients to be equally responsible for direct accident costs. It is argued that in this way clients will become aware and have direct exposure to accident costs, hence serving as an incentive to ensure that measures to a better H&S are in place to avoid similar future occurrences and loss. Other examples of economic incentives include, for instance, the introduction of H&S performance bonds/guarantees which can be taken in both clients' and contractors' names. A facility of this nature would place a practical and real economic incentive on the clients, and indeed on the contractors. The idea of a performance bond has worked well with contractors to ensure performance on project delivery (Meng 2002). A performance bond is an agreement between the client, the contractor and a third party who, in most cases, is a bank or insurance entity (Supardi et al 2011). In the agreement, the bank or insurance institution agrees to pay a sum of money to the client in the event of non-performance of the contract by the contractor (Abdul-Rashid 2004). The principle is that the contractor in this instance commits himself/herself to the client to perform the contract to the client's satisfaction (Ndekugri 1999). An H&S performance bond/guarantee, taken jointly by the client and contractor in favour of the state or enforcing agency, would cause a paradigm shift in the management of H&S in the construction industry. Since clients will have a real economic incentive to ensure a good H&S performance, they will insist on engaging a contractor with a good H&S record, and will further insist on employing professional engineers who will safeguard their interests. Professional bodies, such as engineering institutions, also have a role to play in making economic incentives practicable. Professional bodies sit on boards to draw up and or review standard contract forms which are used in the construction industry as contract documents between clients and contracting entities. Economic incentives such as the H&S performance guarantee can be incorporated in the standard forms and hence make it a contractual obligation. Engineers, who in most cases are designers, have influence on how H&S is managed (Smallwood 2004). Therefore appropriate economic incentives can work for clients, just as they have for contractors and individual workers in the construction industry (Elsler & Nikov 2003; Goodrum & Gangwar 2004). It can therefore be concluded, based on the findings in this study, that economic incentives should not be overlooked in trying to get clients involved and becoming accountable for H&S implementation. With economic incentives, clients are likely to implement all H&S elements on a project, and are also likely to assume leadership in H&S and put H&S programmes in place. It has also been concluded that economic incentives will have a significant impact on client H&S performance. Therefore, when a number of measures are considered to improve H&S standards in the construction industry by influencing client H&S performance, economic incentives may not be overlooked. The only other factor with similar impact significance was found to be legislation. Although political, social, technology and professional bodies have influence on clients' H&S performance, economic incentives were found to have a more significant impact. While the findings in the current study suggest that economic incentives have a significant impact on client H&S performance, it does not, however, suggest that other factors, such as legislation, political, social and technology do not matter. On the contrary, the findings suggest that economic incentives may not be omitted from a list of other factors that also need to be considered and applied in order to motivate clients so that they might be effectively involved and become accountable for H&S management in the construction industry. The current study recommends therefore that ways to incentivise clients be explored, including the prospect of implementing the H&S performance guarantee. Although regulations, such as the 2014 Construction Regulations in South Africa impose farreaching requirements on clients, research informs that, due to low fines and a lack of enforcement, the desired benefits may not be realised if the complementary role of financial incentive is not exploited. DR INNOCENT MUSONDA (R Eng, Pr CM, MCIOB, MEIZ) is a Registered Civil Engineer (Zambia), a Professional Construction Manager (South Africa) and a Chartered Member of the Institute of Building (UK). He holds a PhD in Engineering Management, an MSc in Construction Management and undergraduate qualifications in Civil Engineering. He has worked as a Civil Engineer and Construction Project Manager in Zambia, Botswana and South Africa for government and private organisations. He is currently a consultant to the built environment industry, a researcher and senior lecturer at the University of Johannesburg. PROF JAN-HARM PRETORIUS (Pr Eng, SMIEEE, FSAIEEE) holds a BSc Hons (Electrotechnics), MSc (Pulse Power and Laser Physics), and M Ing and D Ing degrees in Electrical and Electronic Engineering. He was a senior consulting engineer at the South African Atomic Energy Corporation, technology manager at the Satellite Applications Centre at the CSIR, and is currently Head of the Post-Graduate School of Engineering Management at the University of Johannesburg. He is involved in measurement and verification of energy saving for Eskom and Nampower. He has authored 120 research papers and supervised over 20 PhD and 120 Master's students.